Have you ever had an idea that was so awesome that you’ve thought, “OMG I’m a genius, why has nobody ever thought of this before”? 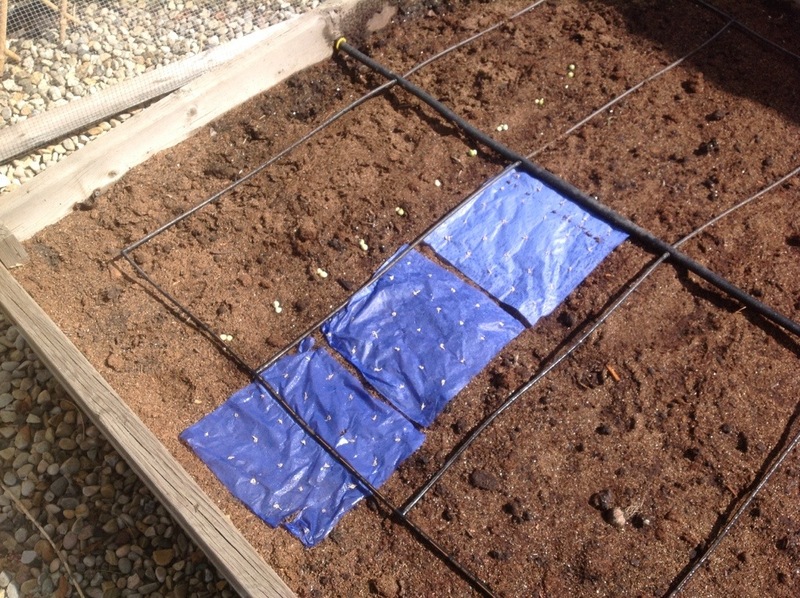 Well, this week I had one of these inspired brain explosions and I came up with Square Foot Garden Tape…or Sheets. Anybody who plants their garden using the square foot technique has discovered that typical carrot and radish tapes don’t work. 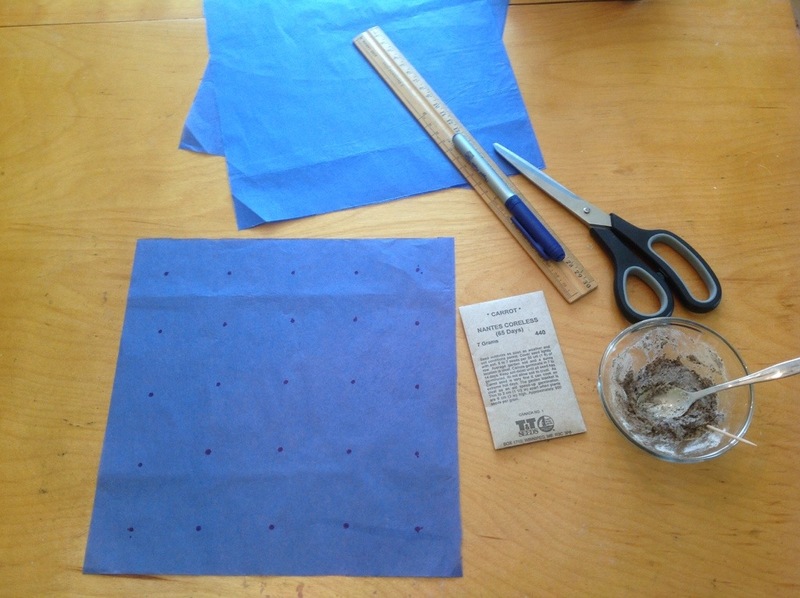 What we need is a sheet of thin paper with the seeds imbedded in the appropriate pattern. Unfortunately a little research led me to discover that I wasn’t the first person to have this LED light bulb moment. Turns out it’s been done before. 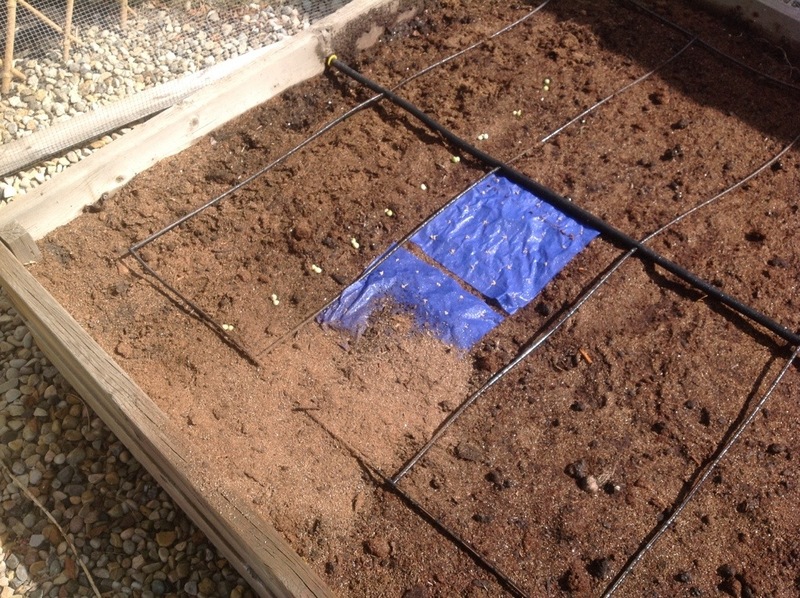 No worries, I went ahead and did my version of square foot seed tape using Sweet Nantes carrot seeds and tissue paper cut to size. I decided to plant 25 seeds per sq ft, which is more than the 16 recommended by Mel Bartholomew in his best selling book “All New Square Foot Gardening”. 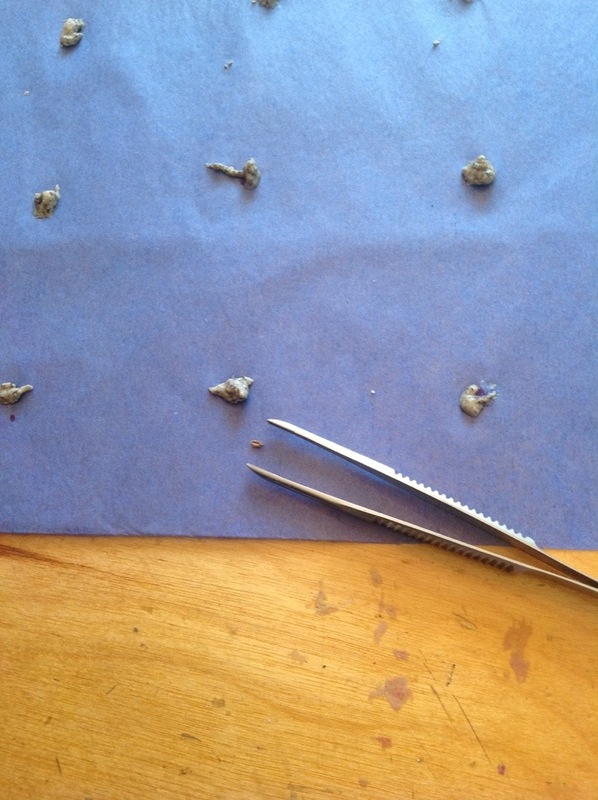 After laying out the pattern on a sheet of tissue paper, I placed a dab of flour/water paste on each dot, the embedded a carrot seed in the paste. 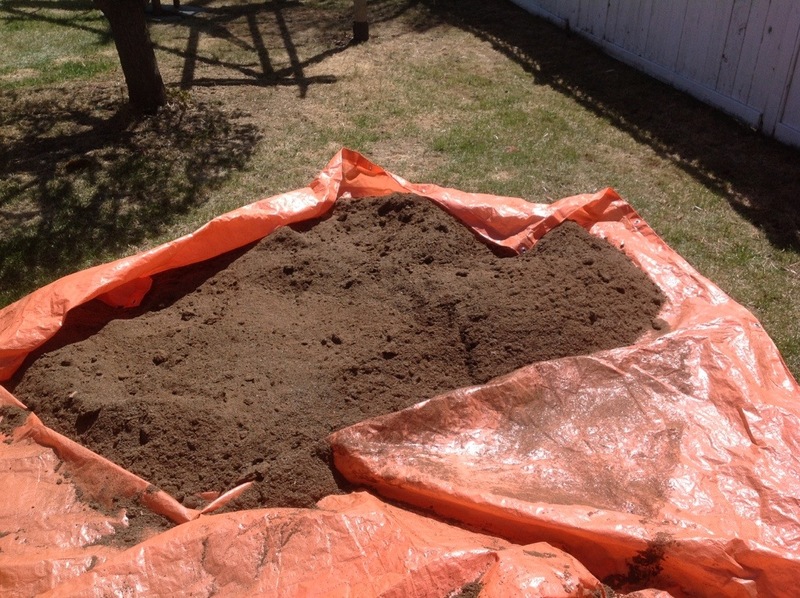 When it came time to plant my garden, all I had to do was lay the sheets on the soil, water them gently and cover them with a thin layer of dirt. It was so much easier on my back. 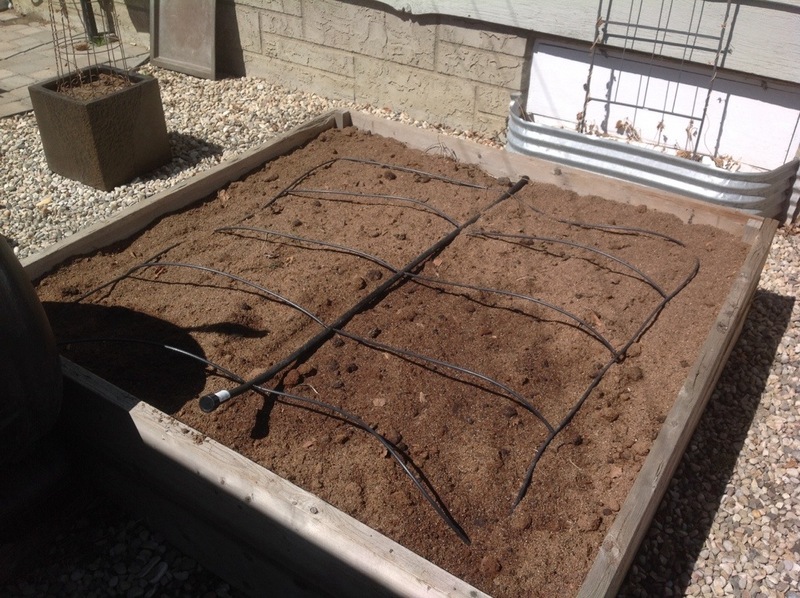 I planted some carrots the “traditional” way as well so that I could determine if there was any difference in germination time. I’ll let you know in a future post. 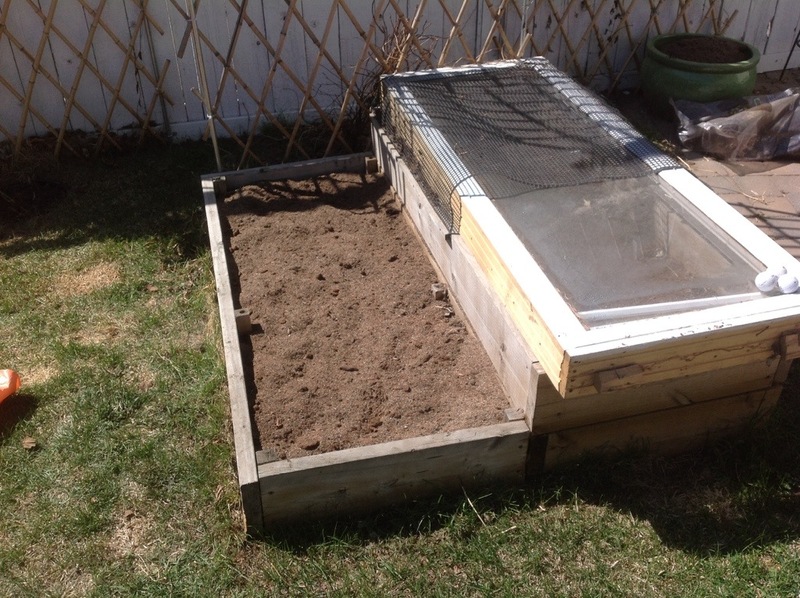 For more information on square foot gardening you should have a look at this previous post. 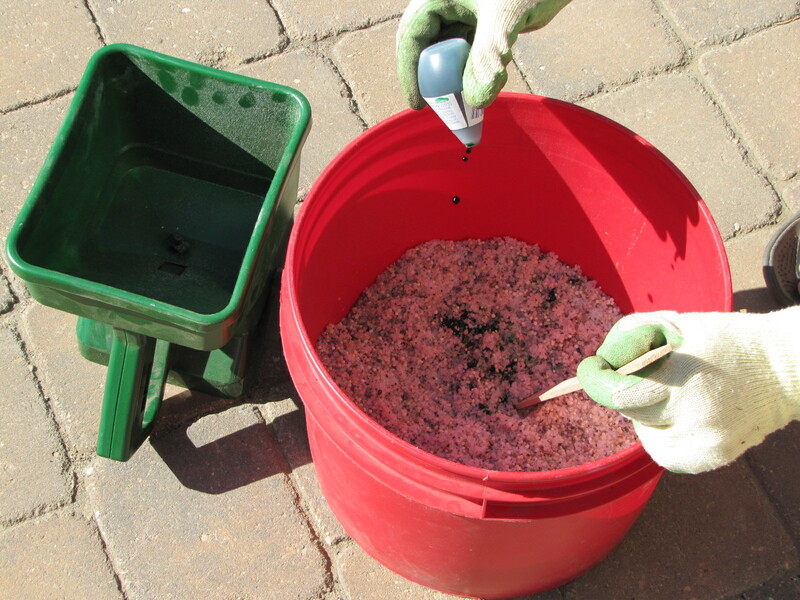 Mixing Soil. Like a Boss. 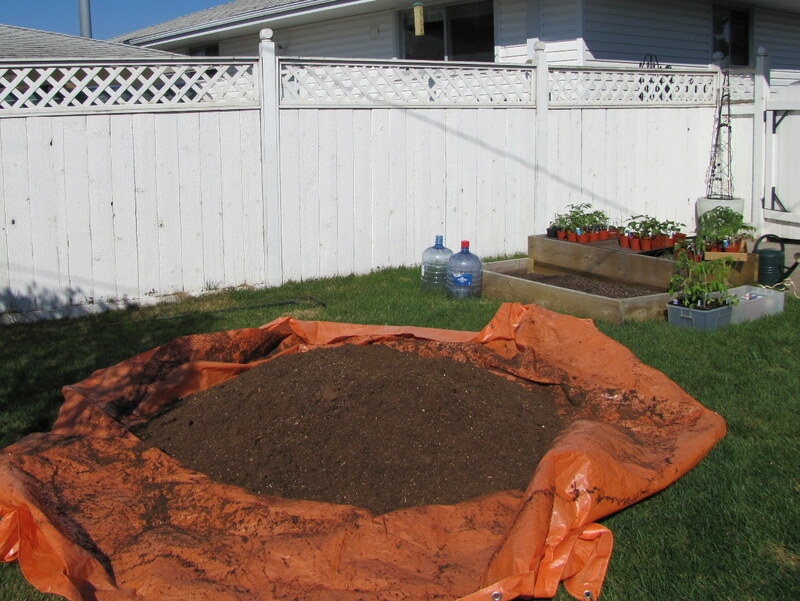 I wrote about my soil mixture that I use for my raised beds here a few years ago. 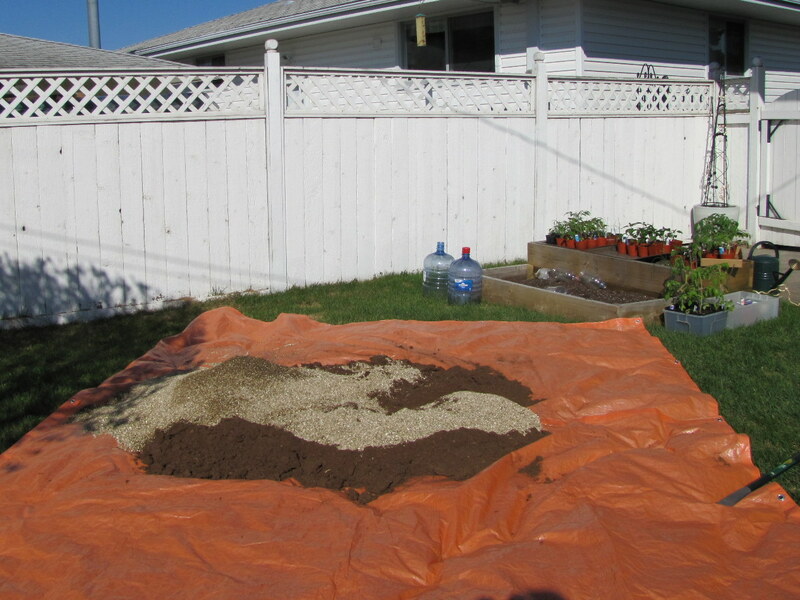 It’s a mix of 1/3 peat moss, 1/3 vermiculite and 1/3 manure or compost. 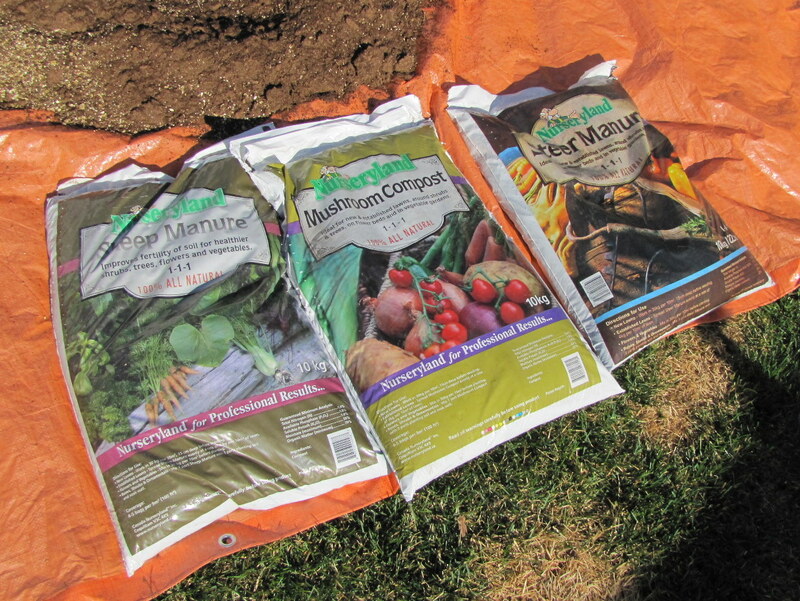 It’s essentially “Mel’s Mix” from the Square Foot Gardener Mel Bartholomew. 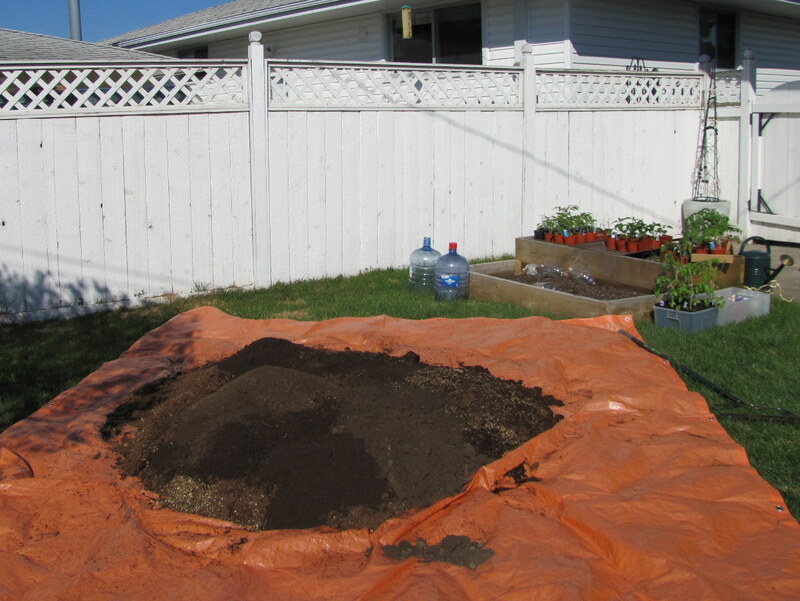 Here in Edmonton you can find the large 3.8 cubic foot block of peat moss just about anywhere (Walmart, Canadian Tire, any Garden Centre). 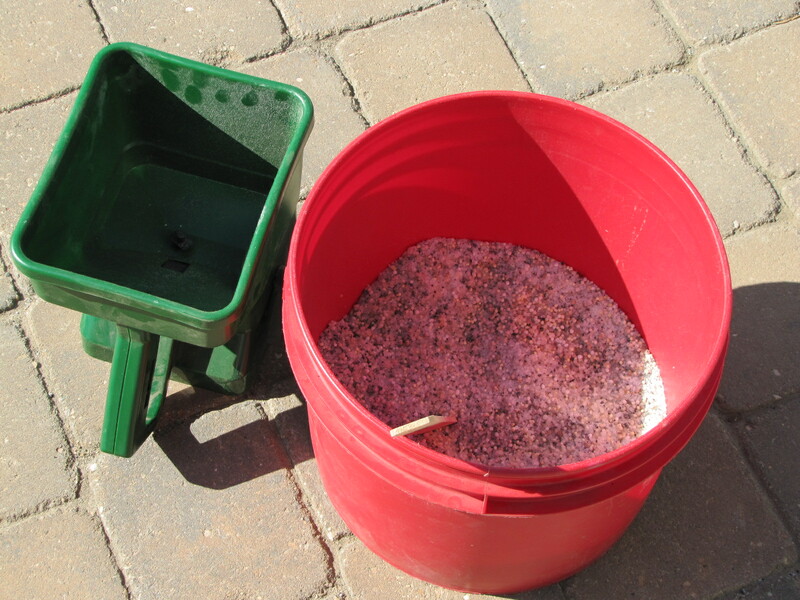 I buy my 118 litre bag of vermiculite at Apache Seeds and the manure wherever I can find good selection. 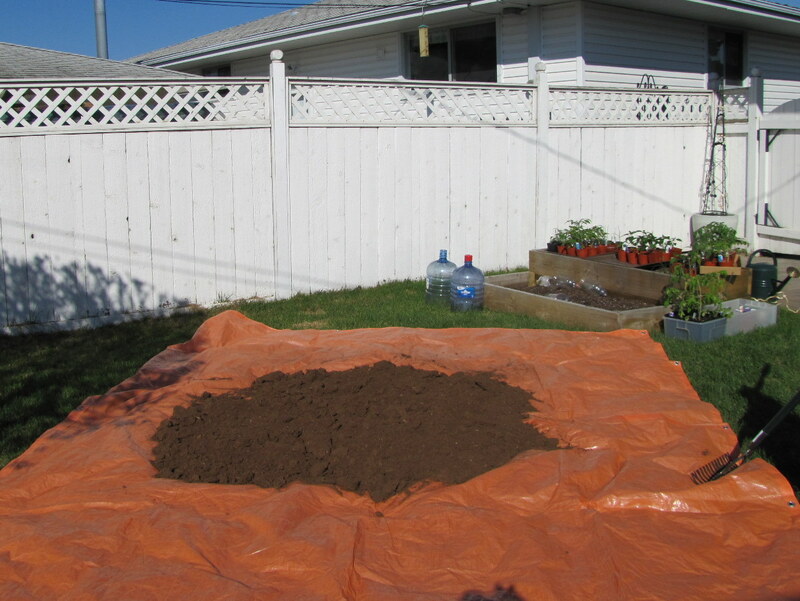 Altogether it costs about $52 to make up a large batch of soil which I use to supplement my existing beds or make new ones. Some of my raised beds don’t really need more volume, they just need the addition of compost or manure. Every fall I dig in leaves and grass cuttings which help to lighten the soil, then in the spring I like to add some composted material as well. 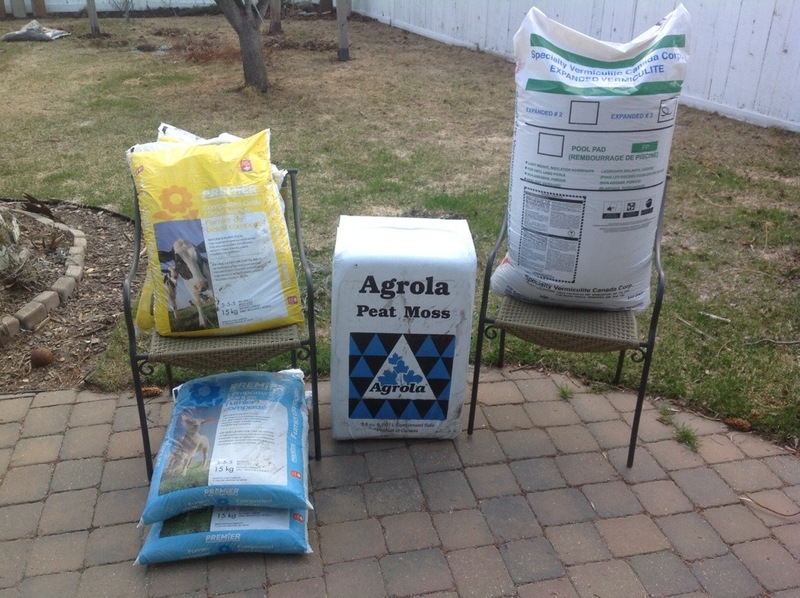 This keeps the garden healthy and helps with moisture retention over the warm summer months. I’m forever looking for ways to reuse things I have around the house when it comes time to sow my spring seeds. 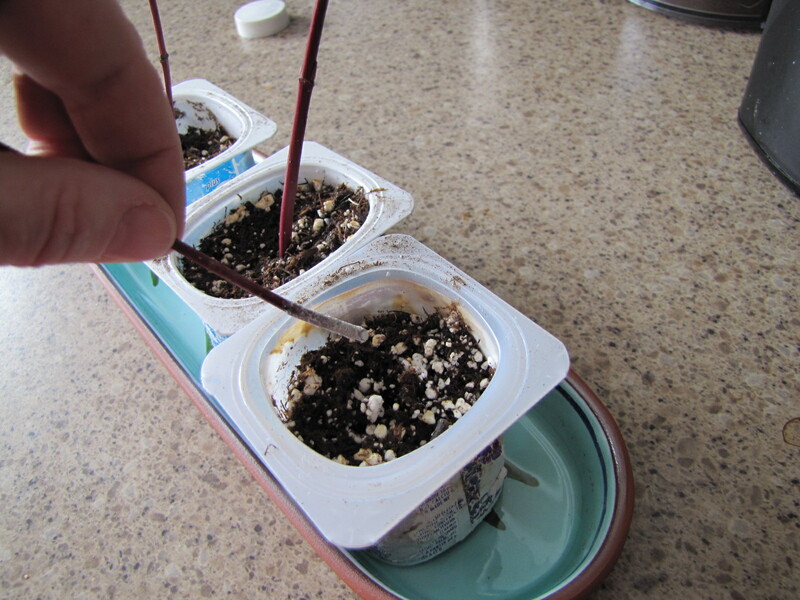 I use anything I can get my hands on from yogurt cups to take-out containers. This year I decided to try making small paper planters from toilet paper rolls. Each roll can be cut in half to make two planters – tiny little planters suitable for some of the seedlings I’ll sow last, like lettuce and morning glory. 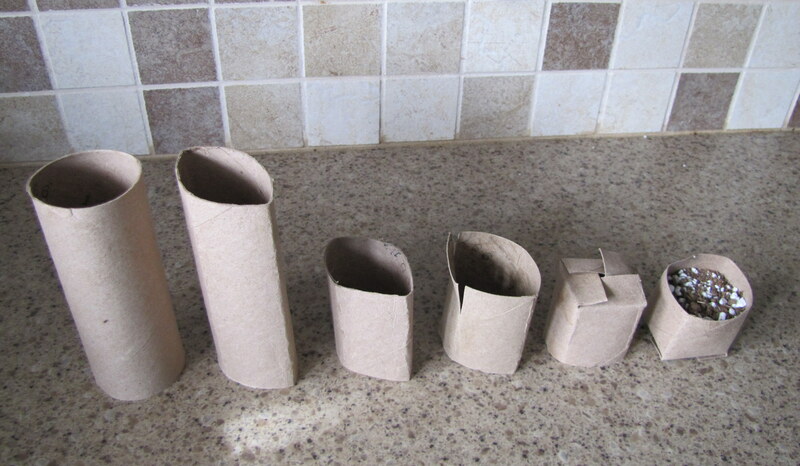 Fold the tp rolls flat then again so that they become square-ish. Cut them in half then make a 1cm slice along each fold. Fold these slits as you would to close a box. Flip and fill. 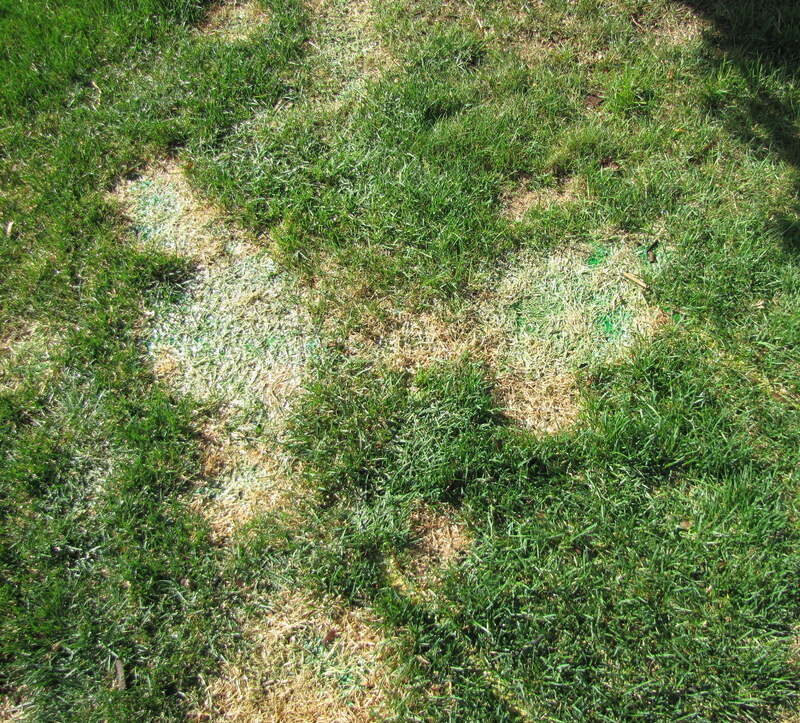 I was thinking…why don’t they make spray paint for the lawn so that I can paint the bare spots in the spring until they fill in? 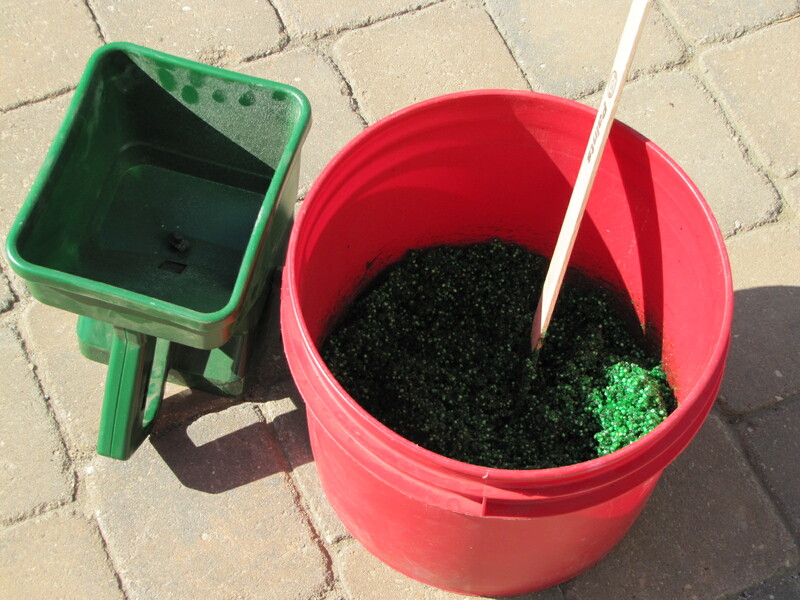 Well, it turns out they do make grass paint; the problem is that I can’t find any in Canada. If it exists here, I don’t know where. So my next thought was, why not make it myself? It can’t be too difficult…right. Well, yes and no. 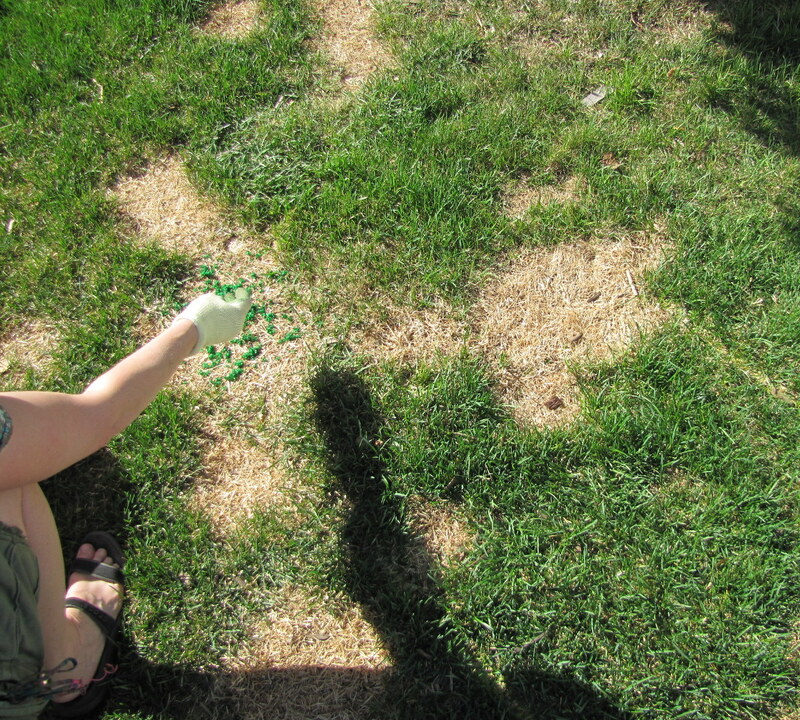 I found a recipe for grass paint, but I’m afraid it didn’t turn out quite as nicely as I had hoped. I really wanted something that worked like that spray-on hair product that you could buy a few years ago – except waterproof…and green. 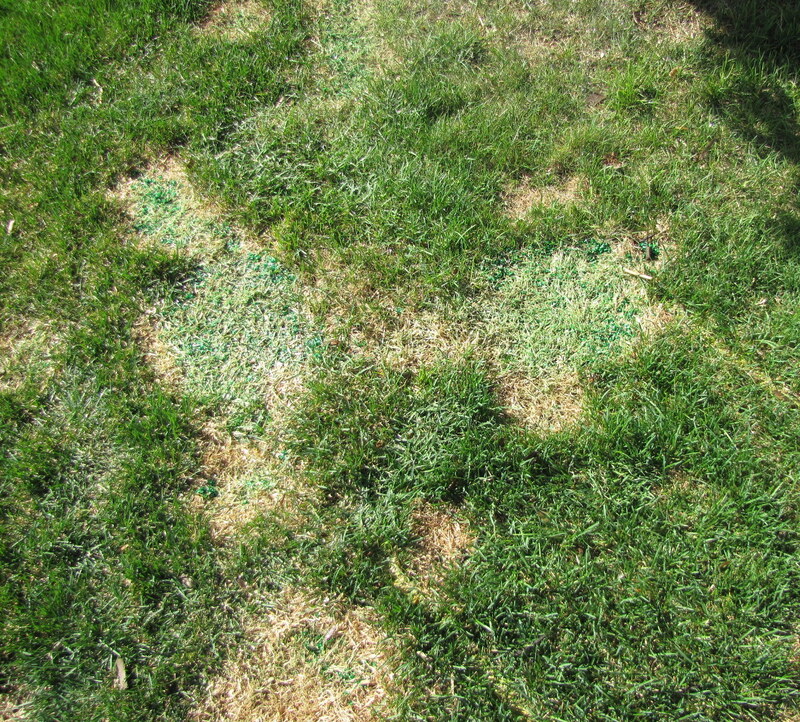 Well, it looks slightly better than nothing, and perhaps with some rain those bare spots will fill in a little more rapidly than they would on their own. I’ll keep you posted. 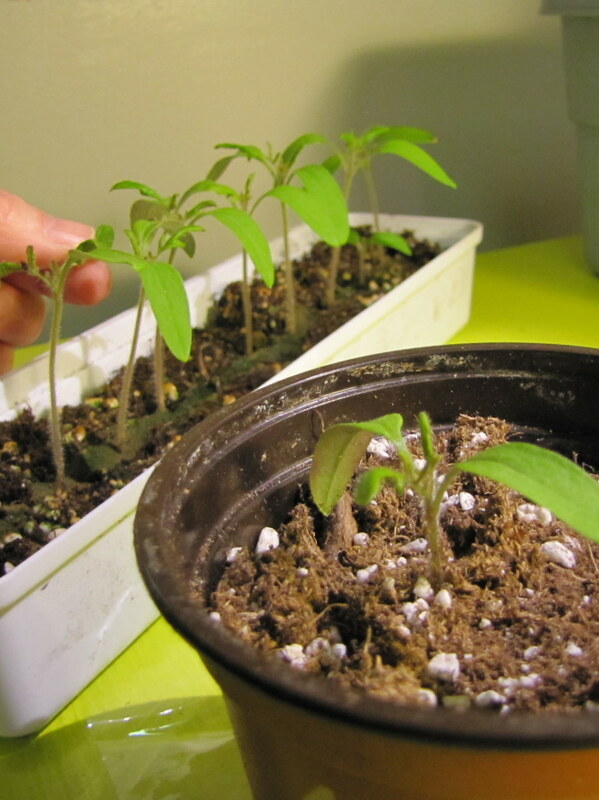 I started my tomatoes indoors on March 20, 2011 and transferred them to their own pots on April 8th. This week it was warm enough (ok, just barely) to start putting them outside a few hours every day. The Tumblers are doing great; I’ve already transplanted some of them to larger pots as you can see in the photo. I made sure to plant then even deeper in the new pot, burying another 2-3 inches of the central stalk. 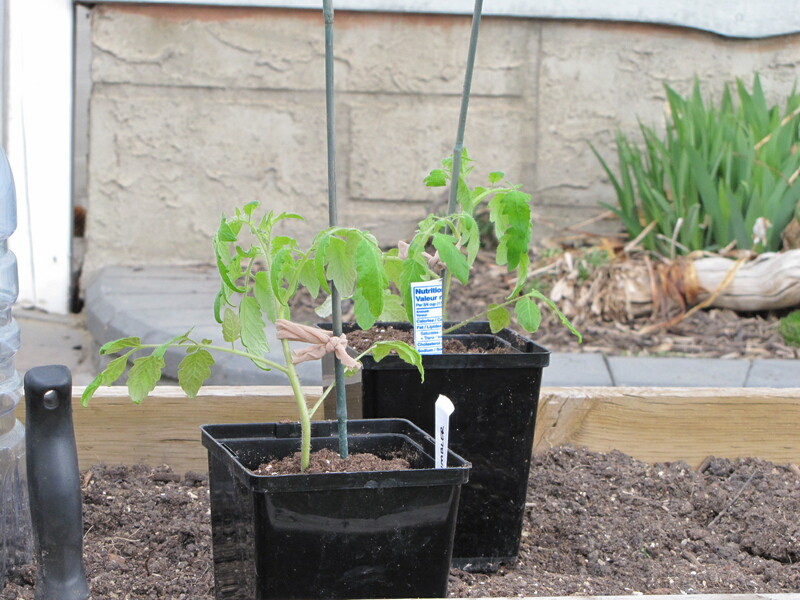 When I put the tomatoes out to harden them off, generally about two weeks before last frost, I begin by only exposing them for a couple of hours per day. Ideally they shouldn’t get any significant wind or direct sunlight for the first while. 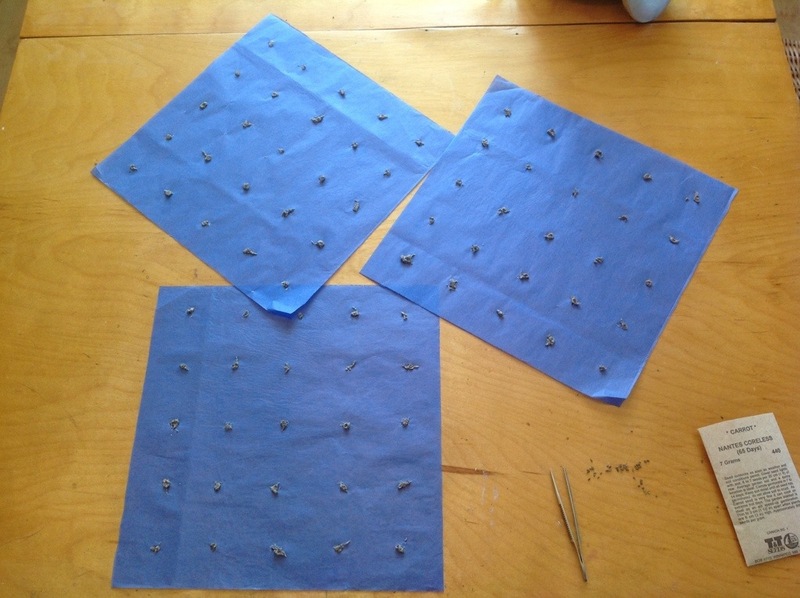 Hardening off is critical to the success of seedlings which have been raised in a safe indoor environment devoid of significant air circulation and UV radiation. My grocery store began using these new non-refillable water bottles a few months ago. 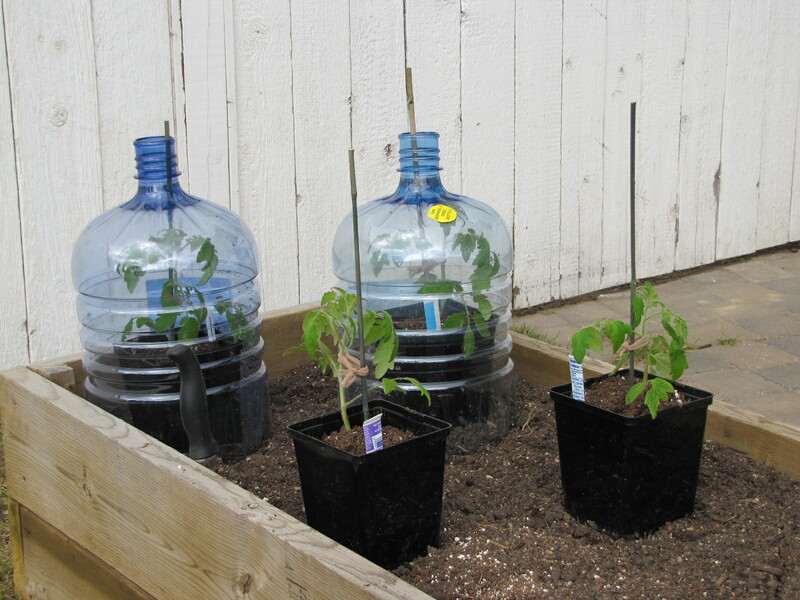 The deposit is a paltry twenty-five cents, so I decided they would make great cloches for the bigger tomatoes. I use the top of a juice bottle for the smaller ones. 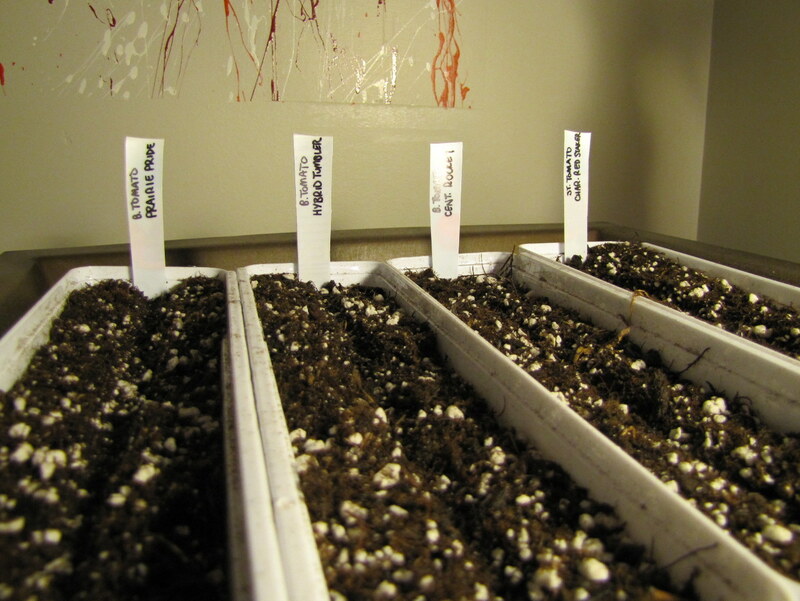 It’s exciting to think that I’ll be able to transplant many of my seedlings to the garden in only a couple of weeks! 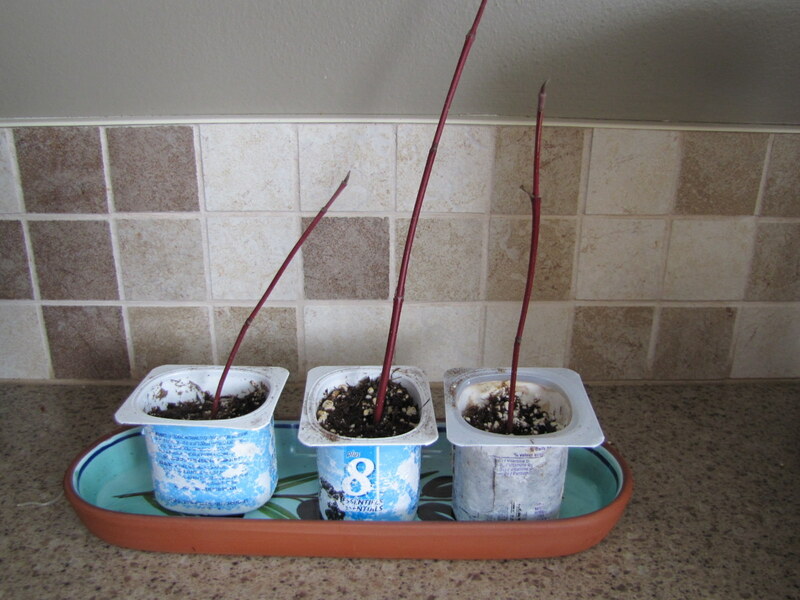 So this spring I thought I’d try my luck at propagating some dogwood cuttings. I’ve read mixed reviews on the subject. Some say that you can only do it in the fall after they have bloomed. Some say that they don’t root very successfully at all. Others say that they will root but won’t survive their first winter because they aren’t hardy enough to survive when rooted this way. Well, I’ve got nothing to lose but a branch or two of my dogwood bushes, so what the heck. I’ve got a Red Osier and an Arctic Fire, so I took a six inch cutting from each just above the spot where it branches off. According to my reading I should have taken a cutting just below a node – so if this doesn’t work then I have myself to blame. 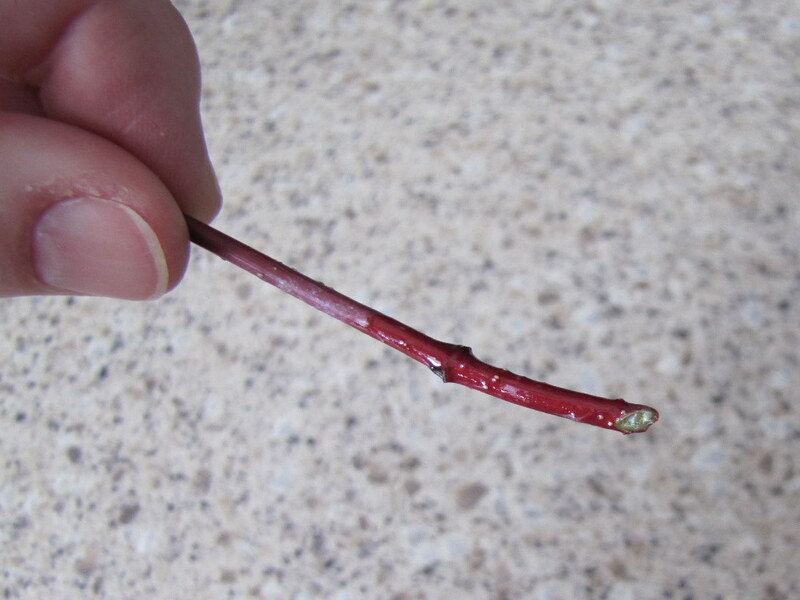 I made the cut at about 30 degrees and immediately wet the end and dipped it in rooting powder. 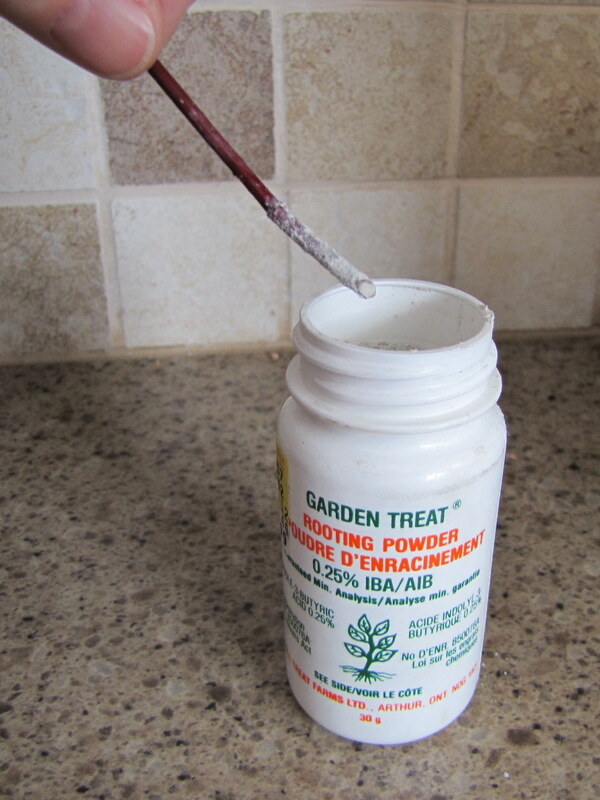 Rooting powder stimulates the formation of roots on cuttings and saves a great deal of time and frustration. I stuck the cuttings an inch and a half deep in a small container of sterile starter mix and made sure they were stable and very moist. The cuttings now sit in my south-facing kitchen window and I’ll begin putting them outside for the day once things warm up a bit. Pulling them out to check them for roots is NOT wise. The best strategy is to watch for buds.